Porcelain Perforated Grids | Patio and Hearth Co. Prepare all your favorite food on the grill – even smaller food that would otherwise fall through grill grates! 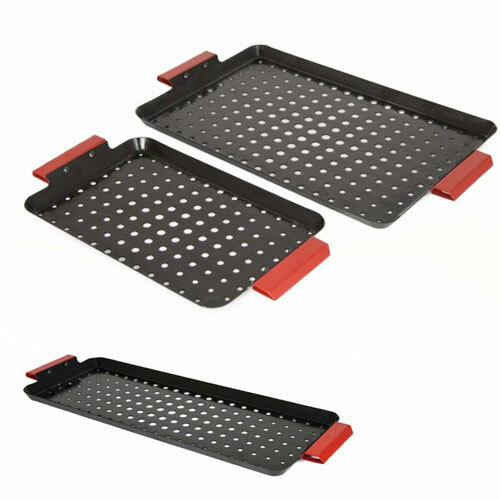 This set of Enameled Perforated Grids conducts high heat with which to cook your veggies, kabobs, fish and smaller cuts of meat, but are lightweight and easy to clean. The perforations in the grids allow juices to drain and also create temperature zones, with the middle of the grid getting the hottest. Food should be placed in the middle for searing and closer to edges if less heat is preferred. Includes one small and one medium grid. Made of durable steel. Dishwasher safe. Prepare all your favorite food on the grill – even smaller food that would otherwise fall through grill grates! Our fish grid conducts high heat with which to cook your fish, scallops, shrimp and other seafood, but is lightweight and easy to clean. The grid’s perforations allow juices to drain and also create temperature zones, with the middle of the grid getting the hottest. Food should be placed in the middle for searing and closer to edges if less heat is preferred. Made of durable steel. Dishwasher safe. Inquire about Porcelain Perforated Grids using the form below.